Beginning July 4, the public will once again be allowed to climb up into the crown of the Statue of Liberty. 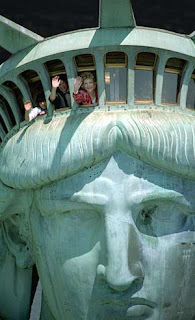 The entire statue was closed for security reasons after the Sept. 11, 2001 terrorist attacks. The base and other areas have since reopened, but the crown and spiral staircase remained closed. About 30 people an hour will be able to visit the crown at a time. New security measures and improvements eventually will enable about 200,000 people a year to get inside Lady Liberty's head and the view from small windows. 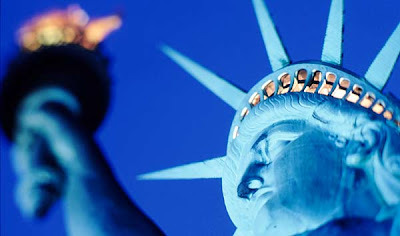 Presented to America by the people of France in 1886, the statue sits on 12-acre Liberty Island in New York Harbor. It is just over 305 feet tall from the ground to the top of the torch flame. The crown has 25 windows and seven spikes. National Public Radio recently found Seven Obscure Facts About the Statue Of Liberty. Spike Meaning - Do the seven spikes represent the seven seas and seven continents of the world? That’s the explaination according to the Web sites of the National Park Service and the Statue of Liberty Club. However, "That's not true," says Barry Moreno, author of The Statue of Liberty Encyclopedia and the park's official librarian. The spikes are sun rays, he says, and the circle is "simply a halo or what in art is called a nimbus, showing she is divine." He adds that the Web site needs to be changed. Weight, Weight, Don't Tell Me! - The statue is fashioned from copper atop an undergirding of steel. The copper in the statue weighs 31 tons, the steel weighs 125 tons and the concrete foundation is 27,000 tons. Do Not Torch -The statue's torch has been closed to the public since the "Black Tom" explosions in 1916. German agents sabotaged a munitions depot on a nearby island on July 30, 1916, and shrapnel damaged the statue's torch and skirt. Today, members of the National Park Service must scale a 40-foot ladder to maintain the floodlights in the torch. Winds of Change - When the wind blows 50 miles an hour, the statue sways three inches and the torch shifts five inches. Give Me Liberty and Give Me Death - Though the statue symbolizes hope and optimism to millions, it has been the setting for at least three suicides over the years, says Moreno. He believes the first may have been in 1929, when a young fellow, turned down by his girlfriend, threw himself from the crown. In 1997, the New York Daily News reported that a 30-year-old man from Senegal plunged 100 feet to his death. "All indications are that it was a suicide," said Manny Strumpf, the National Park Service spokesman at the time. There have been no murders that Moreno is aware of, but there was a 2006 novel titled Murder at the Statue of Liberty by Manny Strumpf. Liberty Goes Hollywood - Besides showing up at the beginning of every Columbia Pictures production, the Statue of Liberty has starred in films since cinema's early days. Charlie Chaplin featured it in his 1917 film The Immigrant. And Alfred Hitchcock used the statue as a backdrop for his 1942 feature film The Saboteur. The Statue's Trident - Vandalism is a perennial problem, park service officials say. When the crown was open, people stuck chewing gum everywhere and wrote their names with lipstick. If you go to Liberty Island, be sure to also check out the miniature building sculptures there too. Check out my other Liberty posts as well here.